Garth Fagan, who has never blinked at challenge, takes on the conventions of the stage space in “EDGE/JOY,” a world premiere. 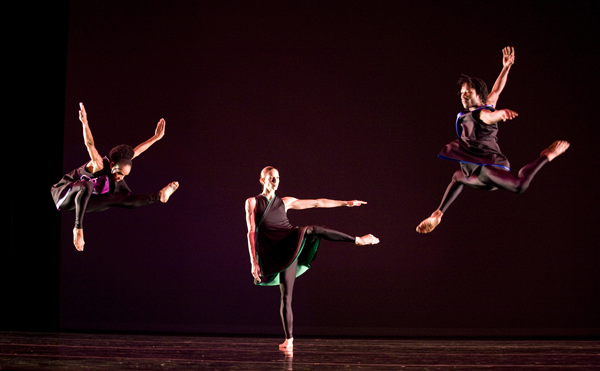 The new dance is one of the highlights of Garth Fagan Dance’s 2007 season at The Joyce Theater, November 6-11. Two programs are scheduled. “EDGE/JOY,” a full company dance, embodies the singular pleasure derived from balancing at the edge, going eyeball to eyeball with the unexpected, if not the unaccepted. Through Fagan’s radical re-envisioning of the stage space—a great deal of the action takes place along its periphery; there are many overlapping entrances and exits, and sections meld into each other—the dance upsets our assumptions, while rewarding the daring with movement invention and the joy and challenge of new ideas. Ricardo Zohn-Muldoon’s accompanying music, a suite of three of his works scored for vibraphone, guitar, marimba, cello, violin, clarinet, piano, and flute will be played live by the Eastman Music Ensemble on the first two nights of the engagement. Differences between dancers—age, height, agility, speed, temperament—are celebrated as subject and metaphor in last year’s riveting premiere, “SENKU,” performed to music by Joshua Uzoiwe, Oswald Russell, Coleridge-Taylor Perkinson and Samuel Coleridge-Taylor. In addition to creating a pulsing mosaic of the performers’ talents and skills, the emotionally-charged dance suggests the variety and riches of the art form itself. Showing another dimension of Fagan’s concerns and fervent imagination is 2005’s tour de force, “LIFE: DARK/LIGHT,” a humanistic celebration of the bonds that communalize people as reflected in the complex rhythms of Billy Bang’s Asian-influenced jazz violin music. In “Prelude: Discipline Is Freedom” Fagan offers audiences inspiring insight into how his dancers develop their gleaming technique—without a trace of slickness. The season repertory also includes the passionate and sensual “Spring Yaounde” section from Fagan’s 1991 full-evening classic “Griot New York.” From 1978, there will be the movement-packed “From Before” set to Caribbean music by Ralph MacDonald, and from 1995 there is “Earth Eagle First Circle,” most simply described as a modern dance interpretation of a Native American ceremony filtered through Fagan’s jazz-inflected imagination. Garth Fagan, a 1998 Tony Award-winner for his choreography for Broadway hit “The Lion King,” began his career in dance by touring Latin America with Ivy Baxter and her Jamaican national dance company. In addition to studying with Baxter, Fagan trained with Caribbean dance teachers Lavinia Williams and Pearl Primus, as well as with Martha Graham, Mary Hinkson, Alvin Ailey and José Limón. A graduate of Wayne State University, the Jamaican-born choreographer served as director of Detroit’s All-City Dance Company and was a principal soloist and choreographer for the Dance Theatre of Detroit and the Detroit Contemporary Dance Company. In 1970, he moved to Rochester, NY, where he founded Garth Fagan Dance. The company has since appeared in many major venues and arts festivals throughout the United States, as well as internationally in Europe, Africa, Asia, the Middle East, South America, New Zealand, Australia and the West Indies. Following its Joyce season, Garth Fagan Dance will perform in Rochester, NY (November 27–December 2). In 2008, it will be seen in Monmouth, OR (January 23); Eugene, OR (January 26); St. Paul, MN (February 8); Providence, RI (February 20); Chicago, IL (March 1); Asheville, NC (March 4-5); Atlanta, GA (March 8); Wilmington, NC (March 11); Raleigh, NC (March 13); and Albany, NY (March 28). The evening curtain for Garth Fagan Dance’s Joyce Theater season Tuesday and Wednesday is at 7:30pm; on Thursday–Saturday, the show begins at 8pm. Sunday evening’s performance begins at 7:30pm. There will also be 2pm matinees on Saturday and Sunday. Tickets are $44 for all shows except Sunday evening when they are $25. They are available at The Joyce box office or by calling 212-242-0800 or online at www.joyce.org. The Joyce Theater is located at 175 Eighth Avenue at 19th Street.